I recently picked this up, it was balancing on the top of the crime fiction bookshelf. I used to read crime fiction almost exclusively but then I fell in love with YA and put it aside. I like crime fiction because the bad guys always lose and everything always gets sorted out in the end. 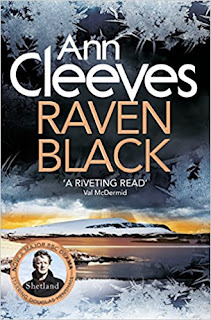 I have my favourites, like Ian Rankin and Peter Robinson, but I'd never read an Ann Cleeves book before. I got this book in my book advent calendar at Christmas, I think, so I thought I should give it a go. I almost wish I'd saved it for the winter though, because it's set just after the New Year and it is very atmospheric of ice and cold. But, I wasn't to know that when I started it, so there we go. 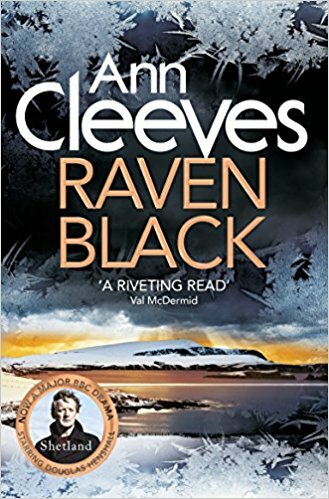 It is the first of Cleeves' Shetland novels, which are now a TV show, although I've never seen it. I would definitely read more of the series, and I really should check out the TV series. I love crime serials as much as I like crime novels! I'm a big fan of Vera, the books of which are also written by Ann Cleeves. The detective in question is Jimmy Perez, a Fair Isle native who's just moved back to Shetland after the break up of his marriage. There actually isn't a lot of his point of view in the book, which I quite liked because it meant we got to see much more of everyone else who lives there. Fran Hunter, a Londoner who was married to Duncan, who's well known on Shetland, is walking home from taking their daughter to school when she sees ravens circling something in the snow. She goes over to investigate and finds the body of her young babysitter, Catherine Ross, buried in the snow. Suspicion immediately falls on Magnus Tait, an old man who lives by himself and who is generally regarded as being "not quite right" by his neighbours. Several years ago a little girl called Catriona Bruce went missing, and although Magnus was questioned at length, charges were never brought against him. Perez is determined to not fall into the trap of immediately collaring Magnus for Catherine's murder, but in doing so he uncovers a whole host of secrets that the inhabitants of Shetland are hiding. All in all I liked the book, although I felt the second half dragged somewhat. I also got very confused by the locations and had to keep looking things up. I could have done with a map of where the main action occurred. But this wasn't really a huge deal, so I'm giving the book four out of five stars. I was intrigued by Jimmy Perez and would like to read more about him.